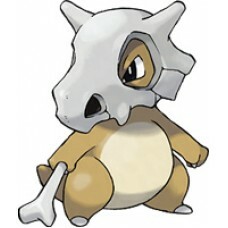 Because it never removes its skull helmet, no one has ever seen this POKMON's real face. Bone Club Ground Physical 65 85 20 1 May cause flinching. Growl Normal Status 0 100 40 1 Lowers opponent's Attack. Tail Whip Normal Status 0 100 30 13 Lowers opponent's Defense. Headbutt Normal Physical 70 100 15 18 May cause flinching. Leer Normal Status 0 100 30 25 Lowers opponent's Defense. Focus Energy Normal Status 0 0 30 31 Increases critical hit ratio. 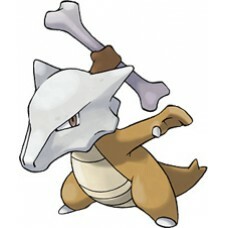 False Swipe Normal Physical 40 100 40 33 Always leaves opponent with at least 1 HP. Fling Dark Physical 0 100 10 33 Power depends on held item. Thrash Normal Physical 120 100 10 38 User attacks for 2-3 turns but then becomes confused. Endeavor Normal Physical 0 100 5 41 Reduces opponent's HP to same as user's. Bone Rush Ground Physical 25 90 10 41 Hits 2-5 times in one turn. Bonemerang Ground Physical 50 90 10 43 Hits twice in one turn. Rage Normal Physical 20 100 20 46 Raises user's Attack when hit. Retaliate Normal Physical 70 100 5 47 Inflicts double damage if a teammate fainted on the last turn. Toxic Poison Status 0 90 10 TM06 Badly poisons opponent. Hidden Power Normal Special 60 100 15 TM10 Type and power depends on user's IVs. Sunny Day Fire Status 0 0 5 TM11 Makes it sunny for 5 turns. Ice Beam Ice Special 90 100 10 TM13 May freeze opponent. Blizzard Ice Special 110 70 5 TM14 May freeze opponent. Protect Normal Status 0 0 10 TM17 User is not affected by opponent's move. Frustration Normal Physical 0 100 20 TM21 Power decreases with higher Happiness. 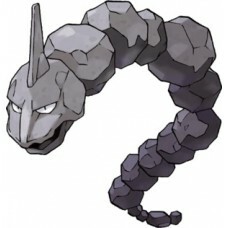 Smack Down Rock Physical 50 100 15 TM23 Makes Flying-type Pokémon vulnerable to Ground moves. Earthquake Ground Physical 100 100 10 TM26 Power is doubled if opponent is underground from using Dig. Return Normal Physical 0 100 20 TM27 Power increases with user's Happiness. Dig Ground Physical 80 100 10 TM28 Digs underground on first turn, attacks on second. Can also escape from caves. Brick Break Fighting Physical 75 100 15 TM31 Breaks through Reflect and Light Screen barriers. Double Team Normal Status 0 0 15 TM32 Raises user's Evasiveness. Sandstorm Rock Status 0 0 10 TM37 Creates a sandstorm for 5 turns. Fire Blast Fire Special 110 85 5 TM38 May burn opponent. Rock Tomb Rock Physical 60 95 15 TM39 Lowers opponent's Speed. Aerial Ace Flying Physical 60 0 20 TM40 Ignores Accuracy and Evasiveness. Facade Normal Physical 70 100 20 TM42 Power doubles if user is burned, poisoned, or paralyzed. Rest Psychic Status 0 0 10 TM44 User sleeps for 2 turns, but user is fully healed. Attract Normal Status 0 100 15 TM45 If opponent is the opposite gender, it's less likely to attack. Thief Dark Physical 60 100 25 TM46 Also steals opponent's held item. Round Normal Special 60 100 15 TM48 Power increases if teammates use it in the same turn. Echoed Voice Normal Special 40 100 15 TM49 Power increases each turn. False Swipe Physical 40 100 40 TM54 Always leaves opponent with at least 1 HP. Fling Physical 0 100 10 TM56 Power depends on held item. Incinerate Fire Special 60 100 15 TM59 Destroys the target's held berry. Retaliate Physical 70 100 5 TM67 Inflicts double damage if a teammate fainted on the last turn. 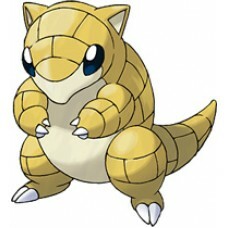 Bulldoze Ground Physical 60 100 20 TM78 Lowers opponent's Speed. Swagger Normal Status 0 90 15 TM87 Opponent becomes confused, but its Attack is raised two stages. Sleep Talk Normal Status 0 0 10 TM88 User performs one of its own moves while sleeping. 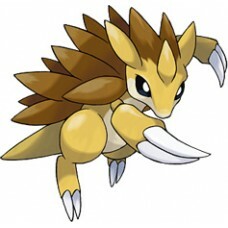 Substitute Normal Status 0 0 10 TM90 Uses HP to creates a decoy that takes hits. Rock Smash Fighting Physical 40 100 15 TM94 May lower opponent's Defense. Generate your own Cubone qr code.